The Arena Lacrosse League is now in its third season and action is hotter than ever. After three weeks of play, two teams remain undefeated. The St. Catharines Shockwave sit first at 4-0 with the Peterborough Timbermen hot on their heels at 3-0. The Toronto Monarchs, at 2-1, are the only other team over .500. Last year’s champion Whitby Steelhawks are surprisingly at the bottom of the standings at 0-3. The NLL’s new partnership with the ALL is already paying dividends as players are working harder than ever to impress pro scouts. For the Timbermen, especially, the drive to succeed is first and foremost on their minds. Head coach Joe Sullivan instituted a culture change this season after the team finished in last place the two prior years. The team now practices during the mornings before home games, allowing for better chemistry to develop between the players. And if you don’t make practice, you don’t play. Sullivan is demanding commitment from his team. 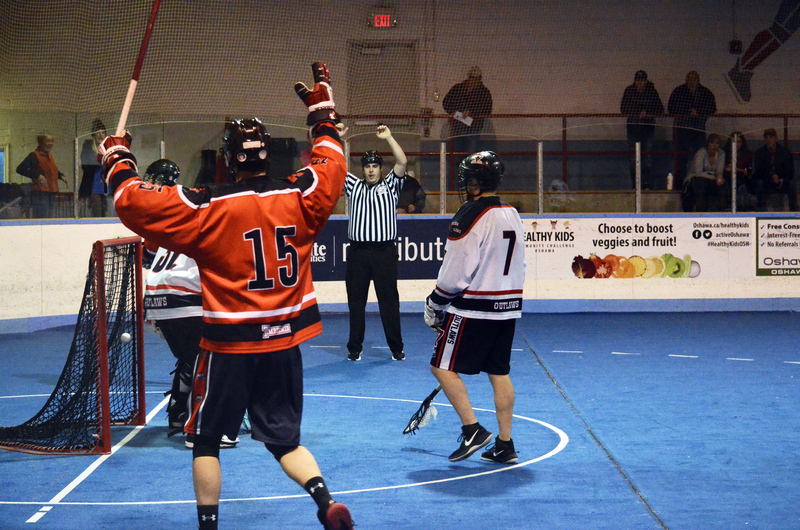 On Saturday the Timbermen won 13-9 over the Oshawa Outlaws, with whom they share a home venue in Children’s Arena in Oshawa. The Steelhawks also call Children’s Arena home. One of the hopes as the league’s partnership with the NLL grows is that more individual owners will come along and invest funds into the teams to get them into their own arenas, but for now, having a central location for the easternmost teams is working. Fan support has improved over last season as the league is a stable presence in downtown Oshawa. Against Oshawa, Blake Kenny led with a hat trick while Aaron Woods, Cameron Simpson and Fred Hartley added two goals each. John St. John, Geoff McNulty and Jeremy McWatters each potted two for the Outlaws. In the evening game at Children’s Arena, the Steelhawks lost to the Shockwave 14-9. Bryan Neufeld had three goals and four assists for St. Catharines, while Chris Attwood scored four goals and one assist. Chase Martin picked up the win in goal. Rochester Knighthawks’ practice player Cam Milligan led the Steelhawks with four goals and four assists. Cody McMahon added a hat trick and four helpers. Also Saturday, the Toronto Monarchs defeated the Paris River Wolves at the Toronto Rock Athletic Centre 13-5. Paris held a 2-1 lead after the first quarter but the Monarchs’ tough defense held the River Wolves to just three more goals in the game including just one in the second half. Five different players scored for the River Wolves, while Jordan Dance led the Monarchs with three goals and four assists. Eddie Renaud had a hat trick and one helper. Tanner Buck and Cam Downey each contributed two goals. Sunday afternoon, the Outlaws suffered their second loss of the weekend, falling 21-14 to the Six Nations Snipers. The Outlaws certainly put up a fight, but two four-goal runs and a seven-goal run from the Snipers buried them. John St. John added four goals and seven assists to his total, while Luke Laszkiewicz scored four goals and two assists. The Snipers were led by Mike McLaughlin (4G/2A), Jake Bomberry (3G/2A), Patrick Corbett (3G/1A), Wes Whitlow (2G/4A) and Tyler Brown (2G/3A). Jake Lazore and Mitch Hannigan combined for the win.